Can Someone Date this Master Light for Me? Just picked it up, 9 Speed Record (soon to be upgraded) and Mavic Elite wheelset. Surprisingly light bike. I am quite delighted. Just curious on the year -- the shop owner was not able to tell me (bike was on consignment). I am already seeing someone, and she doesn't like it if I date anyone but her. I can't tell much from the picture. But some of the recent Colnagos have a serial number stamped on one of the dropouts. If it's not obvious what the date is from the stamp, put the serial number into Google. I'll take what I can get and this was in the price range, and is the bike I've been dreaming of for quite some time. 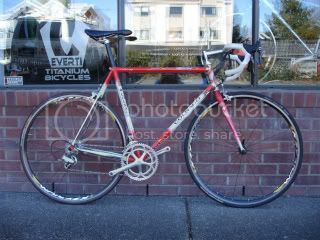 Nothing quite says "eccentric old grouch" as an old Colnago steelie. Can't wait to put a leg over her. I'm not knocking the bike. just having fun with the thread title. Have fun with her...she looks like she has potential. Hey, why the F is everybody here looking at me? What am I the friggin retro expert? Downtube Shifters Good For Race-Training?